We’ve all been there. You’ve been driving your kids to-and-fro or you’re headed home from work, it’s 6 pm, and you have nothing to eat. While we can argue that it’s less expensive to cook a meal at home, the reality is that sometimes you just can’t (or don’t want to! ), and fast food feels like the only option. But making a decent choice can be somewhat challenging. Chains touting “improved ingredients” and listing calorie counts can sway your decision and make you believe you’re making a healthy choice. But are you really? I recently had lunch with a friend at Panera. We were celebrating my birthday by shopping at the mall sans kids, and we headed to the food court. I got the Lentil Quinoa Bowl with Cage-Free Egg and was excited to try it, but it was so incredibly salty I couldn’t even continue! I ended up eating some (I was hungry!) but felt parched afterward. Later on, I looked up the sodium content: 1200 mg. OMG! I thought I was making a good choice, but in my opinion, the sodium blew that theory out the window. In case you find yourself in a similar situation, I’ve put together a list of decent meals at four popular chains. Let me preface by saying that none of these options are perfect. And yes, those who like to call out GMO’s can have a field day, but please do it somewhere else today. And yes, not everything is organic. If you want it your way, make it at home. But if you are going to order out, these are some of my suggestions. This salad provides a mixture of romaine lettuce and kale along with organic quinoa, cucumbers, almonds, and kalamata olives. While the vegetable offerings could be greater, the sodium content is not as sky-high as some of the others (710 mg) and sugar is only at 4g. Be sure to go easy on the dressing and go easy on the sodium for the rest of the day since you’d be getting a solid serving in this meal. First up, the oatmeal is a mixture of rolled and steel-cut oats. Skip the brown sugar (comes as a topping) but add the nuts. Add some honey (near the coffee bar) for a natural sweetener instead. The Protein Bistro Box includes fruit, peanut butter, a hard-boiled egg, and a piece of bread. I’d skip the bread since it’s not whole grain, and I suggest mixing the peanut butter into your oatmeal for something different. My daughter and I were at the airport in Newark. We had just gotten off a 16-hour flight and had a 4-hour layover. She was hungry, and I spotted Jamba Juice. She wanted a smoothie, and since I was too tired to see straight and because I’m a 90-95% gal, I obliged. I tried a few sips of it and was turned off by the sweetness. She drank the whole thing, which I later discovered had 62 grams of sugar in it. OMG. The yogurt bowl contains nonfat Greek yogurt topped with fresh bananas, blueberries, strawberries, honey, and flax seed granola. We don’t suggest nonfat generally, but that is what they offer. Since this weighs in with 40g of sugar, I’d suggest asking them to serve the granola on the side so you can only use a portion of it and also asking if you can add the honey yourself so you can sweeten it to your liking (and reduce the sugar content there as well). While we also don’t believe in juicing on a regular basis, Jamba Juice’s Great Greens is a blend of juiced cucumbers, apples, spinach, kale, lemons, and chia seeds. Or, if you like carrot juice, that’s another option (it’s obviously juiced carrots). Pair one of these juices with some oatmeal topped with bananas, strawberries, or blueberries (you can choose two) for a meal. I’m a big fan of Jason’s Deli. My kids love to get the salad bar (their choice) and load up on salad as well as those muffins and crackers that are part of the options (not the best, but I pick my battles). I also generally get the salad bar and make sure to load up on as many colors as I can while adding nuts and a hard boiled egg or two. Again, I realize that it’s not all organic, etc., but some of it is, and it’s one time I don’t have to cook or clean up. They don’t have trans fat, food dyes, processed MSG, or HFCS (aside from a few fountain drinks, which my family won’t be ordering). So I’m all in! If you’re tired of hearing that you should be ordering oatmeal when you are out, you’re in luck. I realize not everyone wants to eat vegetarian or meatless, so carnivores take note: Jason’s Deli has a few decent options. You can find all of them on their PDF menu. The Ranchero Wrap is natural grilled chicken breast (not organic) served on an organic wheat wrap that’s partially whole-wheat with pico de gallo on top (skip the ranch). Order half a wrap along with steamed veggies or the salad bar for one option. You can also build your own sandwich on the organic wrap (our favorite bread choice available). What do you order when you’re trying to stick to real food out and about? Previous Post: « What’s in your cereal? I recently ate at Zoe’s Kitchen and really enjoyed it. Their website has a lot of nutrition information and even a feature that allows you to sort out menu items based on ingredients or allergens you’re trying to avoid – a huge convenience for those with food allergies. Admittedly, there weren’t a lot of choices once I’d screened out dairy (for my son who’s allergic) but at least there were some things I could order for him – and they were decently healthy, yummy choices. Also their kid’s menu is way better than most, nothing fried, with a side of fruit that was substantial and very fresh. When traveling I try to pack our food but do occasionally have to stop at a fast food place. Often none of these better options are available and my go-to if forced to choose from conventional fast food has been Wendy’s, for a plain baked potato topped with chili. Far from perfect, but sometimes you have to do the best you can. Absolutely agree that sometimes you have to do the best that you can do. The plain baked potato with some chili is not a bad option and I also like that Zoe’s has some decent options, too. I usually get a side salad (no dressing) with a cup of chili at Wendy’s. We like panera and just sub the bread for whole wheat or the sprouted whole grain roll when ordering. We also like jason’s deli & our kids choose the salad bar by choice also :-) Great post. I’ve also been impressed with our museum’s cafe, of all places. Not all of the choices are good, but hidden among the junk are some choices I can live with and they have a nice salad bar. You forgot taco time! Amazing options-even gluten free friendly options. I am not familiar with Taco Time! Maybe they are not on the East Coast? That’s probably it. I live in Washington state. Taco Time is a NW thing. Also, very high in sodium. You have to take of all the chicken, salsa, and other sauces to get to 800 mg. But not too bad in a pinch. I like to get the burrito bowl at Chipotle. I get brown rice, whichever meat sounds good that day, veggies, black beans, mild salsa, just a little cheese, lots of lettuce and add guacamole. I don’t count calories or anything else so I don’t know how much sodium is in this meal but it’s reasonably healthy and totally delicious, especially compared to the other fast food options within a few blocks of my house! what do you think of Subway and their turkey salad? I get the same version on wheat bread for my kids, with apple slices and white milk (organic I believe?). I’m a manager at the Jasons Deli in Greenville SC and love how you are promoting Jasons Deli as a healthier alternative! If you are ever in the area feel free to stop by! In a pinch, qdoba’s chicken burrito bowl with grilled chicken, brown rice and fajita vegetables or the spinach feta wrap at Starbuck’s. We don’t have a Jason’s nearby :(. Love your intro: “please do it somewhere else today”. I agree – everything at Starbucks looks like they baked it last month. Ick. Woohoo! I never heard of Qdoba, but there is one near me. I also saw some really great info on Panera Bread in various comments on this blog, that I never knew. They have made a real commitment to serving only food with no additives and are requiring suppliers to provide meat & poultry raised without antibiotics, etc. Their website has a lot of info on this subject. We have Panera in my state, but there’s not one very close to me. <( Maybe one day. I am a fan of the Starbucks boxes, particularly thE PBJ one when I have kids with me. It’s not greasy and awful with craisins, carrots, celery, plus the PBJ and I think almonds. 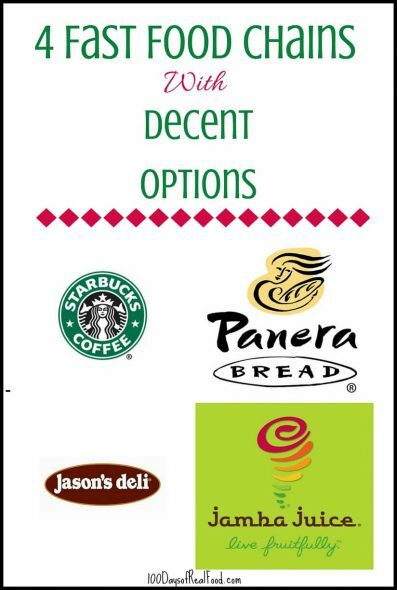 Jason’s Deli, Chipotle, and a few other local (mostly Mexican food) places are our go-t0’s for fast-food. Not all perfect, but made mostly of real food. Since we eat mostly real food at home, we don’t mind eating out once a week or so and avoiding dinner prep and dishes! We do Chipotle also since it is non-GMO and fresh-local. The E. Coli and norovirus are all-natural, too. 9 cases out of millions of meals, These are things you take a chance with when you eat natural without antibiotics. If your scared of e.coli then you are on the wrong website, e-coli is on practically all fresh vegetables, you need to wash well (we all consume small amounts which is fine). Coolgreens has a “tasting plate” for kids where you can pick maybe 6 different options like chicken, grapes, couscous, almonds, figs, apples, among others. My daughter LOVED that when she was first learning to eat real food because they section it out so she felt she had more control of her meal. While this is nice to have, you only listed four locations, and at least one is not even nationwide. The nearest Jason’s Deli locations to me are 500-600 miles away. If you live farther into the northwest than I do, you’re even more out of luck. With only four, I’d have expected better research into whether the choices are actually accessible across the country (and that’s still ignoring non-American readers, but I acknowledge that’s a hard one to accommodate in a single post). Zoe’s Kitchen must be on the “good fast foods” list. Everything is fresh and there are whole grain options for the sandwiches. It’s Greek fast food–homemade hummus with veggies, quinoa salads, grilled kababs–delicious! I went to Starbucks last week and they had a grain and vegetable bowl with lemon-tahini dressing that was awesome! Not sure if they were trying it out or what. It was delicious. Not sure how it stacks up on sodium or nutrition, but I love Noodles & Company for a quick bite. I get the udon noodles with veggies and tofu. Trin, I love Noodles and Co’s Udon Noodle bowl. I can’t imagine it’s healthy though. If you find out the nutritional value, please post! I agree! Starbucks is for Coffee. The food is just awful for the most part. I too would love t see abs expanded list – I live in Washington state and while we have plenty of Starbucks the other three are not usually available if we are on a long road trip. Seems like there should be more options than listed here. I thought the same thing about Starbucks before I knew someone that worked there. He said they put fresh pastries out every day and donate the unsold pastries to a local food bank or homeless shelter at the end of each day. I would never defend their food, but it’s good to know they put out fresh food every day and give the rest to people in need! I just tried Papa Murphy’s pizza last week. It’s a take and bake place – you bake the pizza yourself, after you get it home. They make a big deal out of their fresh ingredients, and say that they make their dough fresh every morning. So I tried a pizza, and I found the cheeses and toppings were fresh and generously-applied, but I was not crazy about the crust. I felt it lacked olive oil flavor, so I looked up the ingredient list, and was disappointed to find “hydrogenated” fat on it. Thought I had found a good option for a non-cooking night, but sadly, NO LUCK. (I’m planning to write to the company about this.) I’d rather fix a peanut butter sandwich at home. I like Qdoba taco salad (minus the taco shell). I get lettuce, pico, grilled chicken, black beans, sautéed mixed veggies, and a tiny squirt of sour cream. Very satisfying and filling. I was at Panera two weeks ago at one of the Nashville TN locations. After checking out the menu on-line ahead of time, I wanted the Power Chicken Hummus Bowl but they did not offer it at that store. I settled for the Lentil Quinoa Bowl w/ an egg and I agree with you it contained way too much sodium. I told Panera that in an on-line survey they sent me soon after I ate there. I will try the Mediterranean Quinoa Salad next time! I had the Med Quinoa Salad the other day and there was almost no quinoa, almost nothing but greens. Ok for a side salad but I was starving afterward. Not a meal salad. Maybe they just made it wrong? What about the noodle company. Their food is artificial flavor, color, sweetener, and preservative free. Some of their products are organic, their pork is naturally raised, and their eggs are free range. They are one of my go to places if I have to eat fast food. The pork pesto buff bowl at Noodles and Company is awesome! Noodles & Company. Great food and thoughtful ingredients! Thanks for the inspiration! We eat out so little that I also enjoy ordering foods I don’t eat at home for a treat when we are out. I love the hearty veggie salad at Starbucks! My new go-to in a pinch is Chipotle burrito bowls. I get brown rice (1 half scoop instead of the standard 2 heaping….) veggies, steak, pico, and extra salad greens. I say no to cheese and sour cream, but yes to guac. A little salty but better than other fast options. So what about eating at a friends house? My family went to 2 small, intimate gatherings over the weekend where they anxiously watched us as we tried every bite. One had cheap processed pizza with store bought birthday cake. One of my daughters and I nibbled, while my husband and other daughter passed due to having more sensitivities. The other get together consisted of white flour noodles with sauce and meat. It’s easy to pass on French bread but we didn’t want to be rude and not eat what they prepared for us!!! How do you guys handle these situations? These situations are so tough; I get it. Personally speaking, if someone is hosting us, we just go with what they serve (for the most part) to avoid coming off as rude. Now I personally don’t eat meat or poultry, am lactose intolerant, etc. – so I don’t eat those foods, but we’ll try to make the best selections based on what there is. While we don’t do food dyes, one of my kids feel VERY strongly about it and makes no exceptions – her choice, which I’m fine with. If she is given something with dyes, she simply says “no thank you” or even expands that she chooses not to do dyes, which I also am fine with, since I think many people can still be educated on and this can be an eye-opener for them. Do the best that you can; maybe just eat a little bit of what is served and know that you can get back to the way that you want to eat after the fact. I was really impressed with the Powerhouse salad at Potbelly. Grilled chicken, cucumber, cherry tomatoes, egg, hummus and avocado on spinach. Between the hummus and avocado I didn’t even need dressing, and everything was very fresh and filling! I like El Pollo Loco. For a larger family the price is great to. Chicken, pinto beans, steamed broccoli, corn tortillas, and a large salad you can dress once you’re home (their creamy cilantro is excellent but I don’t know what’s in it), for about $20. Their marinade has no added sugar or other weird things (I called) and it is very tasty. I like Zoe’s Kitchen. Great Mediterranean food. I’m a bit surprised to see Panera and Jason’s (best salad bar ever!) listed as fast food. I would not consider either of them fast food, but rather a casual restaurant. I was hoping to find out what the best choices may be if you need to eat at a place like McDonald’s, Burger King or Wendy’s. However, this will still be helpful. I can’t believe how much sugar was in the smoothie! I was surprised no mention of vegetable soup at Panera. Their tomato soup is awful (a bowl of salty stuff that literally stings your lips) but most soups are good food, particularly when paired with a salad or half a sandwich. Certainly healthier options that a burger (although I do love a good burger on occasion. Earlier this year we traveled to Arizona. We discovered a wonderful chain called Wildflower Bread Company that is superior to Panera, albeit it similar. Great soup, salads and sandwiches.